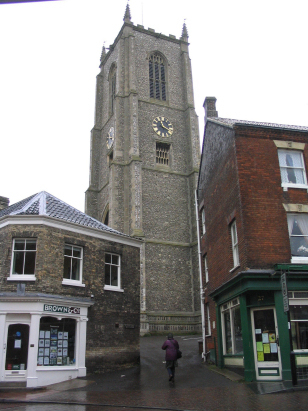 Fakenham which lies in northwestern Norfolk is one of the main market towns of the county. A substantial settlement alongside the upper reaches of the River Wensum, Fakenham was granted a market in 1250 and although this has moved location it is very much still the primary focus of the town. At the core of the town the Market Square with its shops, businesses, inns and taverns is bustling particularly on market day. Two factors primarily influenced the growth of Fakenham, the presence of Hempton Priory to the west limited growth in that direction, the coming of the railway gave Fakenham a spurt which with the closure of the line under the Beching Act has seen some tempering. Despite these factors Fakenham remains very much the capital of this area of Norfolk with a population to match. 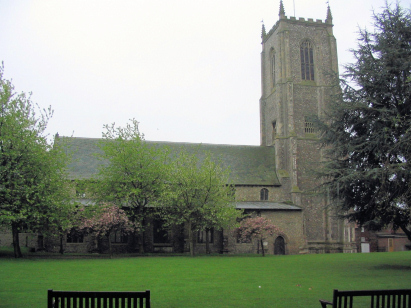 As befits a market town St Peter & St Paul's church is large and sits in a large graveyard to the north of the market square although hemmed in to the south. The church has an impressive western tower, 115 feet tall, and dominates the town. The church has features early for a Norfolk church with Early English and Decorated styles to the fore. However there is also much restoration and addition from later periods including as recent as the mid 20th century. The whole ensemble represents the epitome of a market town church, solid and dependable in support of its thriving community. The records of the parish are covered within two standard 1600-entry register books. It must be said that these register books are rather irregular in their compilation - there are frequent entries out of sequence of "omitted" entries and also many entries inserted into the footers and sides of the pages making for an unseemly mess at times. The two books are filmed on microfiche 7 to 12 in the collection of the Norfolk Record Office and from which this transcript was prepared. These fiche are quite frankly rather elderly and the quality of image is poor, in some cases faded to a state where reading is difficult. Fortunately copies of the images on Familysearch are clearer and these were used when difficulty was experienced. As a result this was a straightforward transcript to prepare and subject to the usual caveats on handwriting it is hoped that few errors will have crept into its compilation.